New York City's Bloomberg Leaves Mixed Results On Health : Shots - Health News Bloomberg reduced smoking in New York City but failed to match that much copied success with other campaigns, such as one to lower obesity rates by regulating the size of sodas sold in city fast-food restaurants. 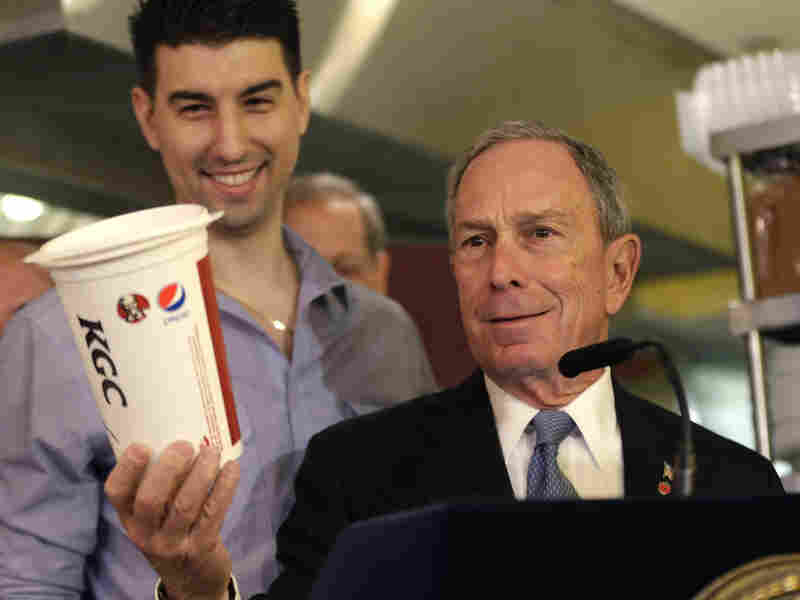 New York City Mayor Michael Bloomberg holds a 64-ounce cup, as Lucky's Cafe owner Greg Anagnostopoulos stands behind him during a news conference at the cafe in New York. On the November day in 2001 when Michael Bloomberg was elected mayor, two things were prominent in New York City's air: fumes from the World Trade Center's smoldering remains, and tobacco smoke in the city's bars, restaurants and other public spaces. Bloomberg helped the city rebuild after the attack on Sept. 11, 2001. And he led the charge against smoking. As a philanthropist, Bloomberg had been interested in public health for a decade. But as mayor, he was in a position to take the advice of experts and turn it into law, affecting how millions of people live their lives. Dr. Alfred Sommer, from Johns Hopkins University, led Mayor-elect Bloomberg's search for a health commissioner. Sommer interviewed Dr. Thomas Frieden for the job. Unlike other candidates, Frieden didn't want to talk about bioterrorism. Sommer recalls the conversation: "'Tobacco. Tobacco's the big thing,' And I said, 'Ummm, Tom, have you heard about 9/11?' And he said, 'Oh, yeah, sure, and that's an issue we have to deal with, but I guarantee that tobacco use is going to kill far more New Yorkers than bioterrorism ever will.' "
Bloomberg bought it, beginning a push that made the city an incubator for often controversial public health experiments. He hired Frieden to crusade against tobacco, raise the stature of the Health Department, and focus on chronic health problems, like diabetes, obesity and heart disease. The department became a hotbed of research and ambitiously gathered data on the health of New Yorkers. "The question before us is straightforward: Does your desire to smoke anywhere at any time trump the right of others to breathe clean air in the workplace?" There were some protests, but the smoking ban passed by an overwhelming margin in the City Council. Resentment festered, though. Take 60-year-old Elizabeth Lane of Harlem. "That Bloomberg. I was so angry at him," she says. "If he was in the same room as me, I could have choked him! I thought he was a dictator. I said, 'Is this right? Can he really tell people what to do and how to do it?' "
Lane had smoked for 40 years and couldn't quit. But the high tobacco taxes got to her, and she found herself dropping hundreds of dollars a month on cigarettes. Lane says family pressure and a lot of prayer moved her to put on a nicotine patch. It worked. She quit, which has helped her indefinitely postpone surgery to open her blood vessels and reduced her risk of cancer, stroke and heart disease. It has also potentially saved taxpayers tens, if not hundreds of thousands of dollars. And quitting smoking changed Lane's mind about Bloomberg. "He knew what he was doing. He did the right thing. And I'm thankful to him now," she says. Curtailing smoking has been Bloomberg's signature public health achievement. Other cities around the world followed New York's lead, including London and Paris. But the dramatic success with smoking has been difficult to replicate. Take his campaign to reduce obesity. Over the past eight years, the Bloomberg administration has banned trans fats, required food establishments to post calorie counts, encouraged green markets and produce carts and started the country's first large-scale registry of people with diabetes. There's been some improvement among schoolchildren. "Overall, obesity rates in K-through-8, children ages 5 to 14, has declined 5.5 percent over the past 5 years," Bloomberg reported in 2011. But among adults, rates of diabetes and obesity have increased. The initiative that garnered the most attention by far was attempting to limit the size of sodas and other sugary beverages served in restaurants, cafes, movie theaters and sports venues. "Compared to smoking, this is an easy battle to win, and nobody's going to stop this, is my impression," Bloomberg announced the day before his soda ban hearing started in the City Council. Bloomberg and his aides argued that people could buy as much soda as they wanted, that the new rule would just reset the default portion size from 24 or 36 ounces back down to 16 — forcing people to think a little bit before gulping down hundreds of calories from a single cup. But opponents quickly got the label "soda ban" to stick. And they got help lobbying against the measure from the food industry. Six in 10 New Yorkers oppose Bloomberg's sugary beverage initiative, according to a New York Times survey. Two state courts so far have rejected the rule, and another court appeal is pending. Bloomberg biographer Joyce Purnick says the backlash might have had as much to do with Bloomberg fatigue as anything. "It was the third term, and here he was doing it again," she says. "So, beyond the opposition of the beverage industry, I also think that it was, 'Enough already. You've done this too many times. I'm getting sick of you. I'm getting sick of your policies. Leave me alone.' "
Bloomberg's successor, Mayor-elect Bill de Blasio, has said he supports the sugary beverage initiative, though he hasn't said much about other efforts. Public health experts aren't sure what to expect, but they doubt that anytime soon they'll have another ally like Bloomberg, an activist policy wonk with a fat checkbook and a willingness to take unpopular political risks.